For all information on this product, you can download a pdf documentation file by clicking on the download button below. The Bevcorp vacuum deaerator is the most common form of deaeration used in meter-based blenders to achieve the lowest dissolved O2 value possible. The deaerator is a “vacuum/recirculation” type oxygen removal system with CO2 injection. Membrane technology is a highly efficient way to remove oxygen from water when temperatures are below 45° F and its performance exceeds conventional vacuum deaeration. Membrane contactors are capable of either removing or adding gasses to fluids. Membrane contactors contain thousands of microporous polypropylene fibers, knitted into an array and wound around a distribution tube. These are hydrophobic so that gasses flow freely while water will not pass through. The Vacuum Deaerator has the capability of optional CIP functionality built into the same skid package. The existing vacuum tank becomes the CIP reservoir. The result on a conventional CIP system is a lower overall hardware cost limited to the heat exchanger with controls, the return and outlet temperature and chemical strength instrumentation. The operator interface is PC-driven with historical data collection and reporting. CIP functions are built into the vacuum deaerator skid by permitting the existing vacuum tank to become the CIP reservoir. 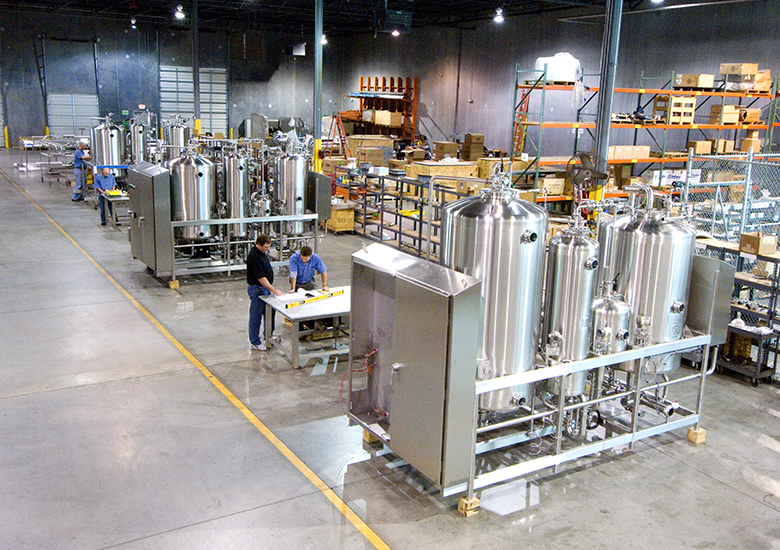 Bevcorp process engineers can audit your systems to identify equipment capabilities and deficiencies in blending units, service utilities, and refrigeration systems.